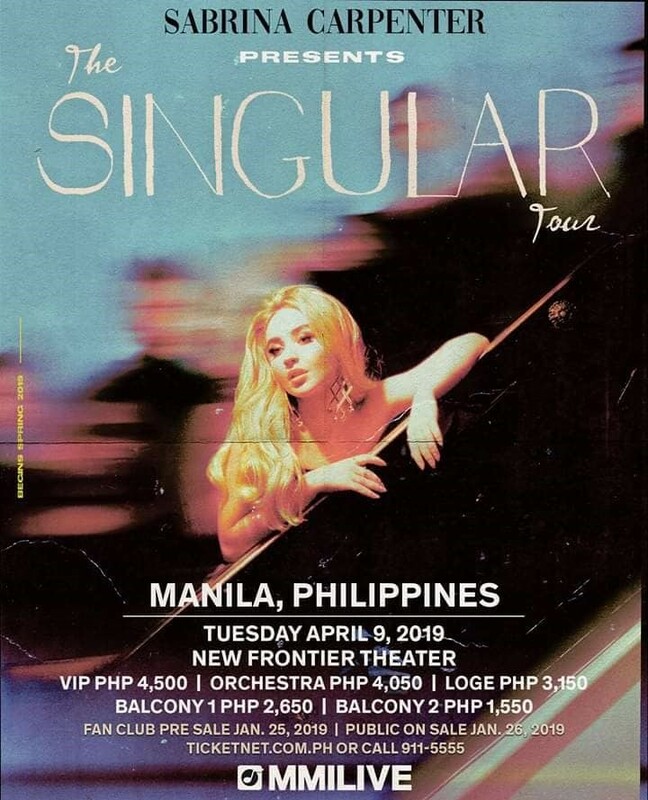 American singer/songwriter and actress Sabrina Carpenter is set to return to Manila for her “The Singular Tour on April 9, 2019, at the New Frontier Theater presented by concert promoter MMI Live. Carpenter’s Manila performance coincides with the release of the album “Singular: Act 1” which features the singles “Almost Love” and “Sue Me.” The album has been two years in the making for the rising pop powerhouse and reported to be released in two “acts”, with Act I in November 2018, and Act II will be released this year. Singular: Act 1 marks her third record in a three-year span since her debut album, and she has grown considerably as an artist and writer between each release. Singular album is a set of eight songs (all of which she co-wrote) blending Carpenter’s R&B-style vocals with the atmospheric pop sensibilities she helmed on her sophomore record EVOlution (2016). Carpenter is known for starring in the feature film “The Hate U Give,” based on Angie Thomas’ 2017 novel of the same name, she’ll be seen in the upcoming Netflix comedy “Tall Girl” and will take on her first leading role in “The Short History of The Long Road” in 2019 in addition to releasing Singular: Act II. Watch out for Sabrina Carpenter at the New Frontier Theater on April 9, 2019. Tickets now available in all TicketNet outlets nationwide or log in at ticketnet.com.ph.